The majority of First Nations students on reserves in Ontario and Alberta are failing at reading, writing and math, according to 2013-14 test results recently published by the Department of Aboriginal Affairs. Students in Atlantic Canada and Manitoba are also struggling. The results of First Nations students who participated in provincial standardized testing were quietly made public in a 130-page departmental performance report published earlier this month. In Ontario, 21 per cent of boys and 32 per cent of girls met the standard for reading and writing. In Alberta, the literacy score was 28 per cent among boys and 36 per cent among girls. Students fared worse at math than they did at reading and writing. In Ontario, 18 per cent of boys and 20 per cent of girls met the standard for numeracy. The results were similar in Alberta, where the numeracy score was 21 per cent among boys and 19 per cent among girls. Students who took part in the standardized testing attended schools that have chosen to take part in the First Nation Student Success Program. Under the FNSSP, schools receive federal funding for projects they propose and in return must administer standardized tests identical to those used by the provinces. It is unclear how many schools take part in the program, or how many students took the tests in 2013-14. The office for Aboriginal Affairs Minister Bernard Valcourt said that information could not be disclosed for "privacy" reasons. "Our government is committed to working with First Nations partners towards our shared goal of ensuring First Nations students have access to a high quality education," Valcourt's office said in an email to CBC News on Monday. "Since 2006, Canada has invested over $10 billion to support elementary and secondary school education for approximately 117,500 First Nation students living on reserve and about $720 million for 429 education facilities projects," the email said. 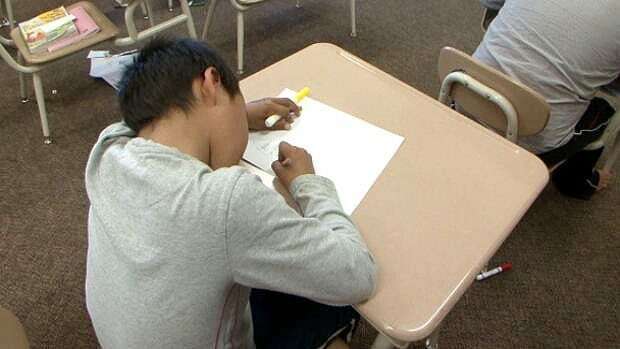 First Nations students on reserves in Atlantic Canada and in Manitoba are also struggling with reading, writing and math, according to the report by Aboriginal Affairs. The literacy score in Atlantic Canada was 65 per cent for boys and 70 per cent for girls. In Manitoba, 53 per cent of boys and 65 per cent of girls met the standard for literacy. The numeracy score in Atlantic Canada was 16 per cent among boys and 54 per cent among girls. The score was highest in Manitoba, where 59 per cent of boys and 50 per cent girls met the standard for numeracy. The results come as $1.9 billion in federal funding hangs in the balance as Ottawa and First Nations leaders remain at an impasse on how to move forward with improving First Nations education, following the departure of former national chief for the Assembly of First Nations Shawn Atleo. Valcourt has said the bill will remain on hold until it receives the support of the Assembly of First Nations - but not only have First Nations leaders rejected the bill, the AFN has asked the government to withdraw it altogether as "a show of good faith." NDP MP Charlie Angus, who represents the northern Ontario riding of Timmins-James Bay, said the results were "shocking." "These results expose the complete failure of the Conservative government to help these children. No matter which way you slice the data, results like this should not be acceptable in Canada. "As a former school board trustee, I can tell you that if any school district in Canada was failing this badly there would be outrage, heads would roll," Angus said in a written statement. Liberal aboriginal affairs critic Carolyn Bennett said the scores are "deeply troubling" and the result of "chronic" and "significant underfunding" by the government. The report notes that although the "long-term goal is to approach provincial equivalence, the short- and medium-term goals are to demonstrate incremental improvements in achievement as a result of new program investments." "Data may not be comparable to provincial rates at this time due to different tabulation methodologies by province," the report said. There are no results for Saskatchewan and Quebec because the provinces "do not have standardized assessments." The data from B.C. was not provided to the department, the report said.